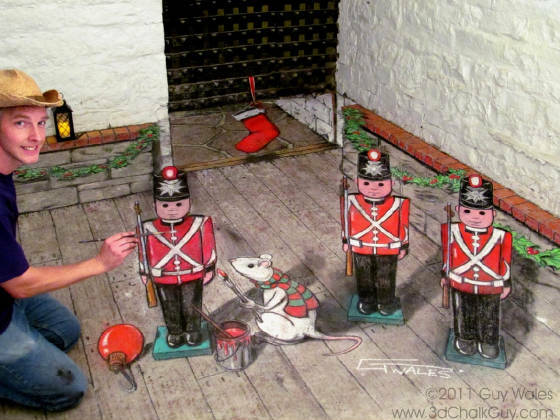 Canadian 3-D chalk artist Guy Wales creates illusions that seem to emerge from the pavement right before your eyes! 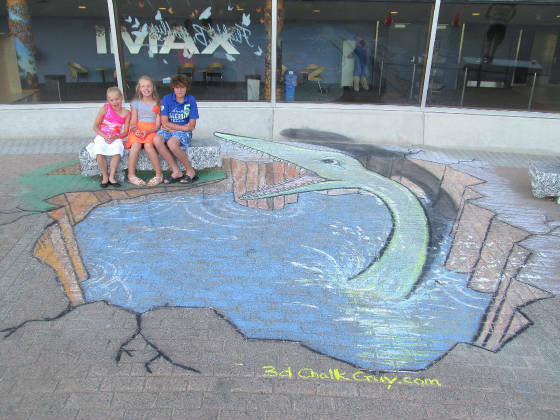 As the “3-D Chalk Guy”, Wales specializes in colorful, family-friendly scenes, tailored to enhance any festival theme. Guy was Special Guest Artist during "Unbelievable Art" Week, at Science North in Sudbury, during "The Science of Ripley's Believe It Or Not" exhibit! In February 2016, he was featured in New York's National Examiner Weekly Magazine. He has entertained hundreds of festival-goers with original designs featuring storybook themes and menacing creatures, all in good fun. Visitors may find themselves being photographed with fabled beasts ranging from a giant purple octopus to a fire-breathing dragon, or man-eating shark! His humorous and whimsical drawings, such as pop-up-book Alice in Wonderland, or a Christmas mouse with toy soldiers, have been crowd-pleasers at festivals and events across Eastern Ontario. 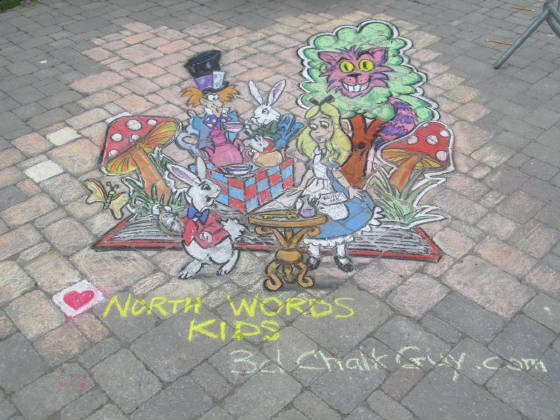 Working outdoors on pavement in the summer months, he continues to create indoor installations in chalk or paint during the Canadian winter. Guy presents his unique pavement art as an interactive attraction, welcoming questions from curious onlookers and children. Viewers can walk around the drawing and observe it from all angles, before seeing the 3-D illusion from the "magic" viewpoint. A memorable family experience for kids and the young-at-heart!